(L-R) Cllr Dylan Rees with Ryan Giggs and Osian Roberts. PICTURE: Anglesey Council. 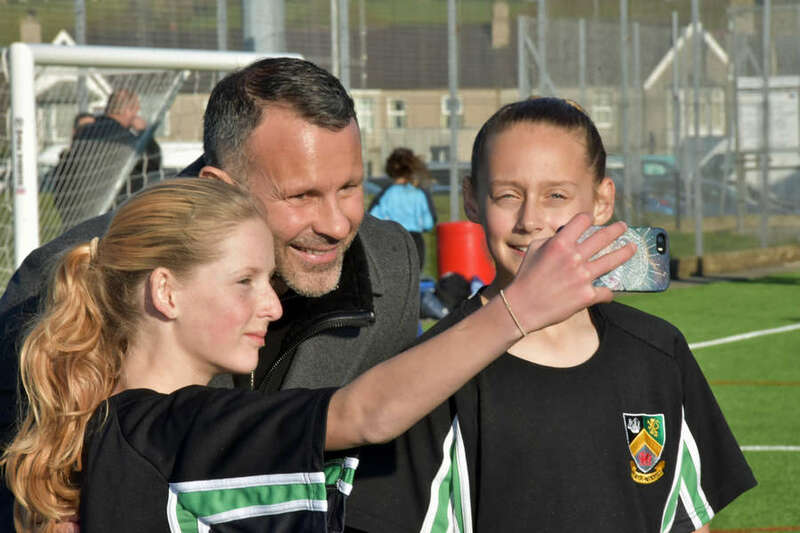 WALES National Football Team Manager, Ryan Giggs officially opened Anglesey’s first full size 3G pitch today. The new £200,000 3G pitch in Llangefni represents a major investment by the County Council in the Island’s leisure services. Giggs has been in charge of the national team since January and so far has a record of three wins, five defeats and a draw to his name (including friendlies). The 44-year-old former Manchester United winger joined his assistant manager Osian Roberts, who grew up in nearby Bodffordd, to unveil the new facility this afternoon. Anglesey Council's leisure portfolio holder, Cllr Carwyn Jones, said: "We were delighted to welcome Ryan and Osian to Llangefni this morning. "We are very grateful to both of them for taking time out of their busy schedules to be here. It was a real honour to have both of them here to officially open our new 3G facility. "This significant capital investment clearly highlights our commitment to ensuring that high quality leisure facilities are available for all Anglesey residents." Ryan Giggs at the new 3G facility in Llangefni. PICTURE: Anglesey Council. Cllr also gave thanks to The Wales Collaborative Sports Facilities Group – which includes the Football Association of Wales, Welsh Rugby Union, Hockey Wales and Sport Wales - for providing financial support towards the project. A special mini-football tournament for year 7 boys and girls from all of the Island’s secondary schools was held to mark the official opening. Giggs and Roberts presented the winners, Ysgol David Hughes and Ysgol Gyfun Llangefni, with their medals. The new 3G pitch, which is located next to Plas Arthur Leisure Centre, has replaced the previous all-weather surface. It is already proving a huge success with local clubs and groups from across the island, and take-up has been very encouraging, according to leisure commercial manager Gerallt Roberts. Youngsters listen up as Giggs gives a talk at the new 3G pitch in Llangefni. PICTURE: Anglesey Council. "Our new 3G facility is giving local clubs, schools and local communities access to a high quality sports and training area all-year round, regardless of the weather," he said. "It will also provide a suitable all-weather pitch for the nearby secondary school and sporting activities for children from all over the Island. “All-weather 3G pitches have many advantages over grass surfaces. They do not deteriorate during periods of bad weather, enabling clubs to continue training when, in the past, they could not. The 3G surface will also help ease problems with fixture schedules by reducing the number of postponed matches, which was an issue earlier this year." Anglesey’s Full Council supported the 3G pitch project as part of the 2018/19 Budget. 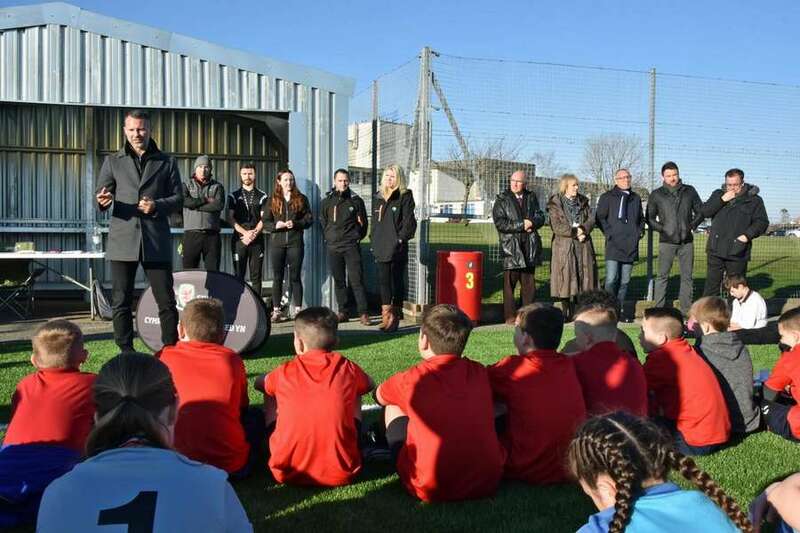 13-time Premier League winner Giggs described the Llangefni facilities as "unbelievable" and urged the youngsters in attendance to "make the most out of it".